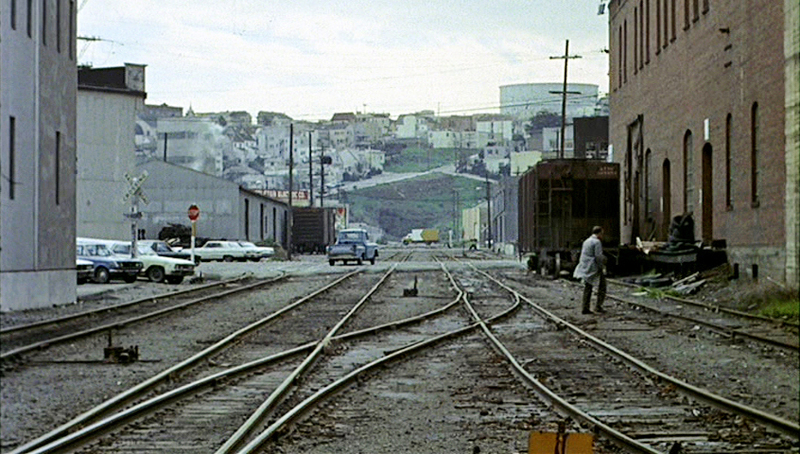 Then ... Caul crosses a set of Western Pacific railroad tracks in what is now the Showplace Square (aka Design) District on the north edge of the Potrero Hill neighborhood. He is on his way to his workshop in the old brick warehouse on the right (map). In this south-facing view 16th Street crosses ahead of him at the stop sign and the tracks ahead end at 18th Street at the base of Potrero Hill. In 1962 a tunnel that originally took the trains under the hill was filled in after catching fire and causing sinkholes above it. ... and Now, quite a few changes. The railway line has been discontinued; the tracks are gone and this section has become a parking lot reserved for the surrounding business tenants. Straight ahead a modern building straddles the old line and the huge storage tank on top of Potrero Hill has been removed. 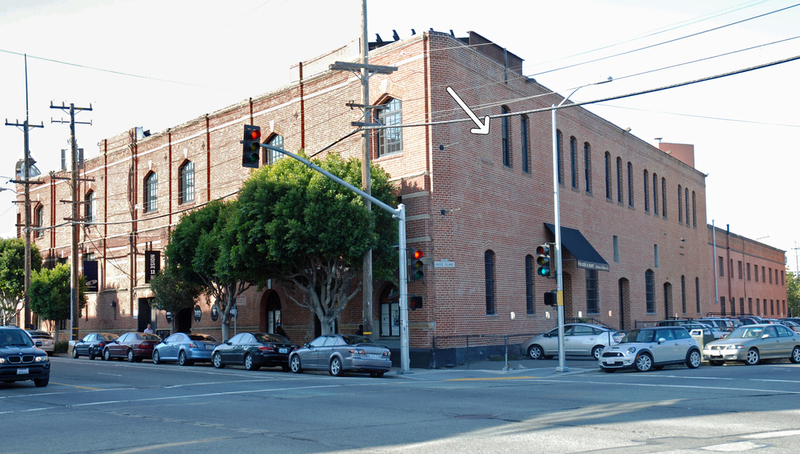 Fortunately for us the warehouse lives on at 1616 16th Street - built in 1912, it remains unchanged from the outside. It was designed by G Albert Landsburgh, best known for his luxury cinemas and theaters up and down the west coast, and the early occupant was the Schlesinger and Bender winery and distillery. The arrow shows us where Caul's workshop was, tucked into the corner of the top (3rd) floor. The arrow also points to a window which was bricked up when the movie was filmed - it still is today. (Click the images for a closer look). Note too the gable-shaped windows on the 16th Street side - we will see them later from the inside. 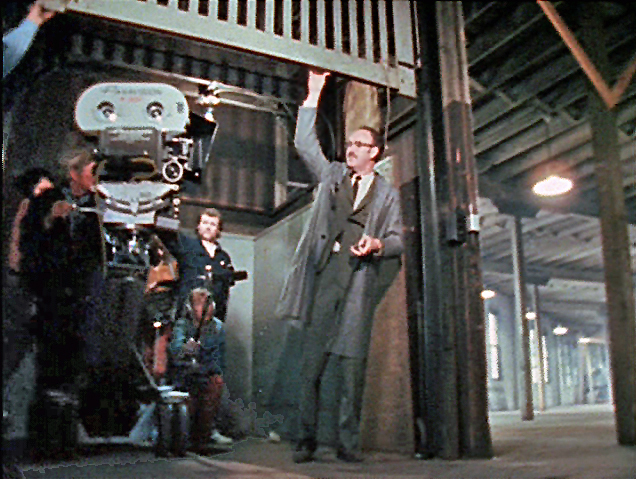 Then ... A documentary on the filming of the movie provided this image of Caul emerging from a freight elevator at the top floor. ... and Now, that elevator has since been walled off but the same call button is still there. ... and Now, this space has since been partitioned into offices and corridors. On that brick wall the hardware now supports a sliding door and the doorway has been opened up to allow access to the other side. The overhead lamps on the other hand seem to be the same ones. The added steelwork was installed for seismic protection. As Caul walks towards the far corner where his workshop is set up we can't help but admire director Coppola's location choice. The array of floor-to-ceiling posts casts radial shadows across the dramatic side-lit space, the whole effect enhanced further by the sunlit gable-shaped windows along the 16th street wall. It's a great shot which cannot be duplicated now that the floor has been subdivided into offices. Then ... 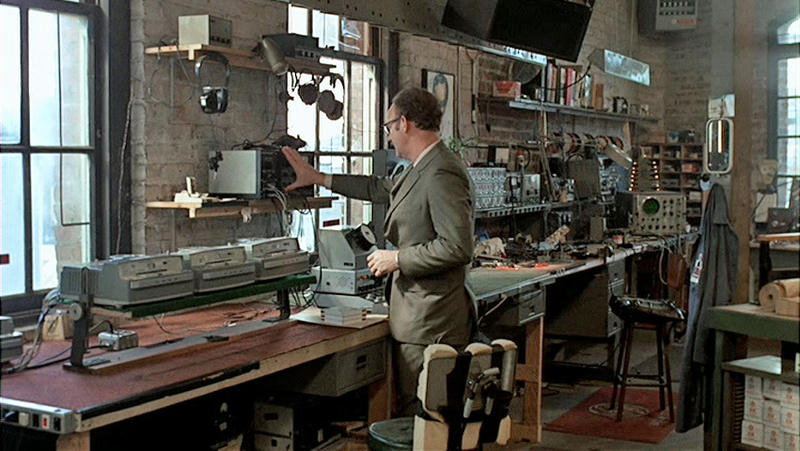 The workshop is where Caul creates state-of-the-art electronic gear custom designed for his nefarious work - back then and perhaps even now this type of sophisticated equipment was not commercially available. The bricked-in window seen earlier from the exterior is right of center next to the picture on the wall. ... and Now, the studios of Dara Rosenfeld Design and Weisbach Architectural Design now share this space at 1616 16th Street, Suite 360. Here too, added steelwork reassures today’s occupants.